From Butler, go west on Missouri Highway 52 for13 miles. Cemetery is on south side of highway and divided into two sections by county road #12001. From Amoret, go east on Missouri Highway 52 for 1 mile. Co. H. 16 Kans. Cav. son of Donnie Ray and Wanda Lou Sharp Parker, Sr.
Mo. Pvt. 279 Infantry Korea Ph. 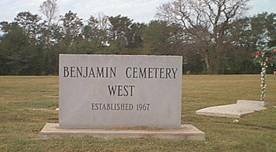 Benjamin cemetery started when a son of Henry and Sarah E. Benjamin, James, died in April 1908 and was buried on his farm. Other children included Harvey (born abt. 1888) Lena (born abt.1889) and Goldia (born abt. 1892). Henry Benjamin was born Henry H. Bengarmine about 1855 in Indiana. Sarah was born about 1858. Additional acreage has been given.